Lower your eyebrows now. It has been a week since the much-ballyhooed flick reteaming former sweethearts Richard Gomez and Sharon Cuneta has been released in cinemas across the archipelago and some cities offshore. Three Words to Forever, a Star Cinema gamble on a love team that never was, raked in P6.5 million at the box office when it opened on Nov. 28. Not much compared to the take of the recent Daniel Padilla-Kathryn Bernardo outing though the latter is also in the movie sans her on and off screen darling. Still, the leading movie production company in the country is hopeful the movie has legs to stand up till about another second and third week in the plexes. Unfavorable notices notwithstanding, the film company proceeds to barrage the potential audience with positive vibes about the Richard-Sharon movie….that it is one members of the family shouldn’t miss because everyone in a family can relate to any of the characters. The movie’s simple premise that is typical of Cathy Garcia Molina’s is about a couple. Rick (Richard Gomez) and Cristy (Sharon Cuneta), after 25 years of marriage, now separated. Both agree to be quiet about it but will go on with the separation only after their trip to Ormoc for the celebration of the 50th wedding anniversary of Cristy’s parents, Cito (Freddie Webb) and Tinay (Liza Lorena). 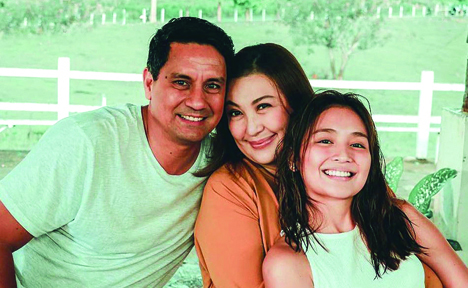 While in Ormoc, Rick and Cristy’s daughter Tin (Kathryn Bernardo) tells them that she is tying the knot with her boyfriend Kyle (Tommy Esguerra). Those that had seen the movie likened it to Four Sisters and a Wedding (2013) and Seven Sundays (2017) that starts out as a humor-laced depiction of an imperfect Filipino family and later explodes with each and every single character unloading all their pent up frustrations with each other. But fans of the abortive Sharon-Richard love team are certainly jubilant about 3 Words to Forever and why not? Star Cinema has proudly claimed it had been able to bring back the tandem that once tickled the fantasies of many Sharonians (especially at the time after the Sharon-Gabby tandem crumbled to the ground like pulverized hollow blocks after a 7.5 magnitude earthquake. The Sharon-Richard tandem was the aftershock of that major blow and it gave many a Sharonian reason to fantasize that their beloved idol’s broken marriage would also get through a rainbow filled fulfillment. But just like in most Tagalog movies about failed marriage, the Sharon-Richard off-screen romance failed to rev up, and the two followed each of their path to separate directions. Now, Richard, mayor of Ormoc City, lives a happy married life with wife Lucy, a congressman in the same city, and Sharon with his Kiko Pangilinan, a senator. In Three Words to Forever however, the audience is able to take a peak at what Richard and Sharon’s love chapter off-screen, though implicitly. And that’s what makes Three Words to Forever something fans are looking forward to see in theaters nationwide. Look out, DC Super Hero Fans! Barry Allen (a.k.a. The Flash) is now on iflix. Running straight from the U.S. screens into your hands, the highly-anticipated series from Warner Bros. International Television Distribution is now available within 24 hours of its U.S. debut for iflixVIP users. In season five, Barry Allen (Grant Gustin) and his new wife, Iris (Candice Patton) are surprised by the arrival of Nora West-Allen (Jessica Parker Kennedy), their speedster daughter from the future. Her arrival brings to light the legacy of every member of Team Flash. While they rally to find a way to return her to her own time, they also discover her presence has altered the timeline and brought the early arrival of the most ruthless, vicious and relentless villain the Team has ever faced: Cicada (Chris Klein). One of iflix’s most popular television shows, The Flash, from Berlanti Productions in association with Warner Bros. Television, is part of iflix’s extensive library of popular international titles fast-tracked from the US including critically-acclaimed Mr. Robot, hit comedy The Good Place S3, horror anthologies Channel Zero: The Dream Door and Midnight Texas S2 – all available on iflix. “We are thrilled to give our subscribers front row seats to such fast-paced action. This underpins our commitment to provide our users with the latest episodes of the world’s most popular shows along with the best local and regional titles available.” Notes Sherwin dela Cruz, co-founder and country manager for iflix Philippines. Now available to over one billion consumers throughout Asia, the Middle East and Africa, iflix has established itself as the clear market leader in video streaming. Offering consumers a vast library of top Hollywood, regional, and local TV shows and movies, including many first run exclusives and award-winning programs, and now news, each subscription allows users to access the services on up to five devices, including phones, laptops, tablets, and television sets, for viewing wherever, whenever.